A few degrees of warming make a big difference. Credit: USDA photo by Jack Dykinga. 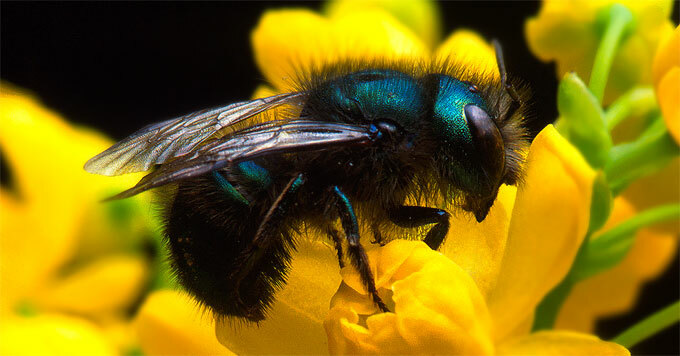 Across the western U.S., a shiny green bee pollinates manzanita shrubs and overwinters in the boreholes of trees. But warming temperatures could make it harder for this species, Osmia ribifloris, to survive in parts of its native range. Paul Caradonna of the Chicago Botanic Gardens tested the effect of warming on these bees in Arizona. He painted nesting boxes black, so they would absorb more heat. Those nests were, on average, three to five degrees hotter than the unpainted ones. That increase is consistent with the warming expected in the Southwest over the next few decades. The effects were dramatic. The bees raised in warmer conditions were smaller. And they emerged from their nests later in the year, which can impact their ability to find food. At a time when bees are already stressed, a climate even a few degrees warmer can spell the difference between life and death.